An important outcome of any clinical intervention is the change in the subject's own perceived state of health. This can be categorized as health-related quality of life (HRQL), utility (preference-based health state), and daily life performance. 174 Swedish subjects with chronic obstructive pulmonary disease (COPD) (mean age 64.3 ± 12 years) completed five self-administered questionnaires: Short Form 36 (SF-36), St George's Respiratory Questionnaire (SGRQ), EuroQol-5D (EQ-5D), Health States-COPD (HS-COPD), and Work Productivity and Activity Impairment Questionnaire for COPD (WPAI-COPD). The subjects scored these outcomes instruments for ease of completion using a 5-point scale. The time taken to complete them was noted and the administrators' opinion of the subjects' comprehension of the questionnaires recorded using a 4-point scale. 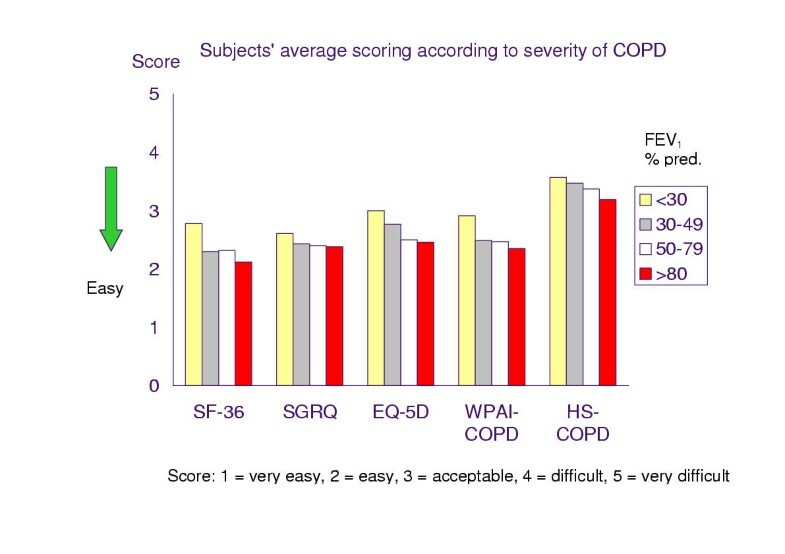 A score of 1–3 ("very easy" to "acceptable") was recorded by 92% of subjects for the SF-36, 90% for SGRQ, 80% for EQ-5D, 83% for WPAI-COPD, and 53% for HS-COPD. The HS-COPD was graded "very difficult" to complete by 21% of subjects compared with 3–5% of subjects for the other questionnaires. The mean time taken to complete all questionnaires was 39 minutes, and the large majority of subjects scored "good" for understanding by the administrator. Age correlated significantly with the degree of the subject's opinion of the ease of completion of five outcomes instruments, while the influence of gender, socio-economic status and disease severity was not statistically significant. Chronic obstructive pulmonary disease (COPD) is a progressive and largely irreversible airways disease characterized by emphysema and chronic bronchitis, resulting in breathlessness, cough and sputum. As the disease progresses, subjects with COPD experience increasing deterioration of their health-related quality of life (HRQL), with greater impairment in their ability to work and declining participation in social and physical activities. COPD is currently the fourth leading cause of death in the US and its incidence is increasing . Typically, COPD affects today middle-aged to elderly men with significant smoking histories. As a result of changing smoking habits, the incidence of COPD in women is rapidly increasing . Respiratory diseases are among the three principal causes of lost working days worldwide and COPD is responsible for the majority of the loss . HRQL, utility, and productivity impairment outcomes instruments are increasingly used in clinical studies. Although their use is established in many fields, such as the gastrointestinal and oncology fields, questionnaires are rarely used as primary endpoints in clinical studies of respiratory disease. The European Agency for the Evaluation of Medicinal Products (EMEA) states that, in clinical studies of COPD, symptomatology should be a primary endpoint, and the use of a disease-specific HRQL questionnaire is recommended . Several disease-specific and generic questionnaires suited to the respiratory field have been developed in recent years. The Short Form 36 (SF-36) and St George's Respiratory Questionnaire (SGRQ) are generic and disease-specific HRQL questionnaires, respectively , . The SF-36 has been used in a number of therapeutic areas including COPD. The SF-36 includes 36 items in 8 domains; Physical Functioning, Role Physical, Bodily Pain, General Health, Vitality, Social Functioning, Role Emotional and Mental Health. Two component summary scores are used, the Physical Component Summary (PCS) and the Mental Component Summary (MCS). The SGRQ has been widely used in both COPD and asthma research and includes 56 items (76 weighted responses) across three domains, symptoms, activity and impact. The EuroQol-5D (EQ-5D) and Health States-COPD (HS-COPD) are generic and disease-specific utility measures, respectively. Utility measures are preference-based measures of health-related quality of life. These measures can be used in economic evaluations . Generally, these measures evaluate subjective preferences for multi-dimensional HRQL on a scale of 0 to 1 (or 100), where 0 usually represents worst possible health and 1 (100) represents perfect health , . EQ-5D has been used in a number of therapeutic areas. EQ-5D includes a vertical rating scale from 0 to 100 and in addition five items including mobility, self-care, usual activity, pain/discomfort and anxiety/depression . The HS-COPD is still under development (personal communication, Gordon Guyatt, McMaster University, Hamilton, Canada) although a preliminary version, tested both in Canada and Sweden, is available. Also the HS-COPD includes a vertical rating scale ranging from 0 (worst possible health-state) to 100 (best possible health-state). Three pre-defined health marker states are to be indicated on the rating scale by the subjects. The subjects then register their own health state using the same scale. The pre-defined health marker states are drafted as narratives with extensive information but are considered as a guide for subjects and are not used in analyses. The Work Productivity and Activity Impairment Questionnaire for COPD (WPAI-COPD) is a productivity and activity impairment instrument covering seven items on the limitations that impact on work and daily activity. It has been applied in some therapeutic areas, such as rhinitis and gastroenterology , . Evidence suggests that the indirect assessment of a subject's HRQL, via relatives, care providers or health professionals, tends to underestimate the level of HRQL impairment ,  and is thus preferable for the subjects to be assessed directly. At present, no data have been published to describe whether subjects with COPD have difficulty completing self-administered questionnaires. Such data on burden of completion are important in evaluating the feasibility of these assessments in clinical studies of COPD and for the interpretation of results. The present study investigated the ease/difficulty of completion as well as the time of completion of the five outcomes instruments, including the two HRQL questionnaires, the two utility questionnaires and the productivity/activity questionnaire by subjects with COPD. The study was performed in a three-month period during the winter of 2000. The study was approved by the Ethics Committee of the University Hospital of Northern Sweden in Umeå. The study sample has been described in previous publications and was used in a recently completed study of cost-of-illness  and a study of exacerbations . In summary, the sample was derived from large-scale population studies of the epidemiology of obstructive airway diseases in Northern Sweden, the OLIN studies. Longitudinal studies of a number of cohorts are in progress since 1985, today including approximately 40,000 people of the general population, including also children and elderly . The inclusion criterion, a diagnosis of COPD, was based on spirometry tests. This diagnosis was defined according to the British Thoracic Society's (BTS) criteria; FEV1 /VC ratio <70% and FEV1 <80% of predicted values, and furthermore, due to the FEV1, divide COPD into mild, moderate and severe disease . In addition, persons with an FEV1 /VC ratio <70% and an FEV1 ≥ 80% of the predicted value were also included in the study. The inclusion of this mild type of COPD is fully in agreement with the recent Global Initiative of Chronic Obstructive Pulmonary Disease (GOLD) guidelines . When stratifying by age, range 28–80 years, and disease severity, some strata contain a low number of subjects. Thus, all subjects having FEV1 < 60% of predicted were included in the study sample, and for subjects with an FEV1 ≥ 60% of predicted, a random sample was drawn from each stratum. The study sample is shown in Table 1. Of the 202 invited, 174 (70 women) participated, which corresponds to 86% of the invited. All but one completed all five questionnaires. One subject completed only the first three questionnaires (SF-36, SGRQ and EQ-5D). Three categories of socio-economic groups were included. The first category was manual workers in industry and in service (n = 78). The second category was non-manual employees and included intermediates, civil servants and professionals (n = 60). The last category comprised all others, including unemployed and housewives (n = 36). Of the 138 'employees', 65 were still working but 73 had retired, of whom 40 had retired early. The mean FEV1 of the subjects was 1.76 ± 0.78 L (range 0.46.– 4.12 L) and 62 ± 20% of predicted normal value (range 18. – 118%). Using the FEV1 classification from the GOLD guidelines, 19 subjects were categorized as being in stage I, 'mild' COPD (FEV1 ≥ 80% pred. ), 82 subjects were in stage IIA, 'moderate' COPD (FEV1 50–79% pred. ), 32 subjects were in stage IIB, 'moderate' COPD (FEV1 30–49% pred. ), and 9 subjects were in stage III 'severe' COPD (FEV1 <30% pred.) . An initial, brief instruction from the administrator, an appointed nurse, was given to all subjects including the following information: all questionnaires should be completed in the given order, no explanation of any question would be given and if a question was not understood, the subjects were told to go to the next question. All questionnaires were completed, unaided, by all subjects in the same and following order: SF-36, EQ-5D, SGRQ, WPAI-COPD and HS-COPD. This order was chosen on the basis of the recommendation that generic measures, such as SF-36 and EQ-5D, should be completed before disease-specific measures, such as SGRQ and HS-COPD, and that HRQL measures should be completed before utility measures. Since EQ-5D and HS-COPD both use a similar rating scale, the WPAI-COPD questionnaire was scheduled between these two questionnaires. Subjects scored questionnaires for ease/difficulty of completion on a scale of 1–5 (1 = very easy, 2 = easy, 3 = acceptable, 4 = difficult and 5 = very difficult) (Table 2). To be completed by administrator. In addition, the administrator gave her opinion of how she felt about the subjects' comprehension of the instruments using a 4-point scale (1 = good understanding, 2 = probably understood, 3 = possibly understood and 4 = did not understand) (Table 2). The time taken by subjects to complete all of the outcomes instruments was also recorded by the administrator. Data were analysed using a linear model with factors for gender, disease severity and socio-economic group and with age as covariate. Trend for disease severity was tested by use of a linear contrast. The Global Initiative for Chronic Obstructive Lung Disease (GOLD) guidelines were used for classification of disease severity . A score of 1–3 ("very easy" to "acceptable") was recorded by 92% of the subjects for SF-36, by 90% for SGRQ, by 83% for WPAI-COPD, 80% for EQ-5D, and by 53% for HS-COPD. Ten to fifteen percent of the subjects found SF-36, SGRQ or EQ-5D "very easy" to complete, with only 3–4% finding these questionnaires "very difficult" to complete (Table 3). The administrator's opinion of the subjects' understanding was generally good, with only 2 subjects graded as having "not understood" (Table 4). The results demonstrate that older subjects have more difficulties completing the questionnaires. The test for trend in difficulty was statistically significant for all questionnaires when all groups were compared: SF-36 p = 0.003, SGRQ p < 0.001, EQ-5D p < 0.001, WPAI-COPD p < 0.001, and HS-COPD p < 0.001. 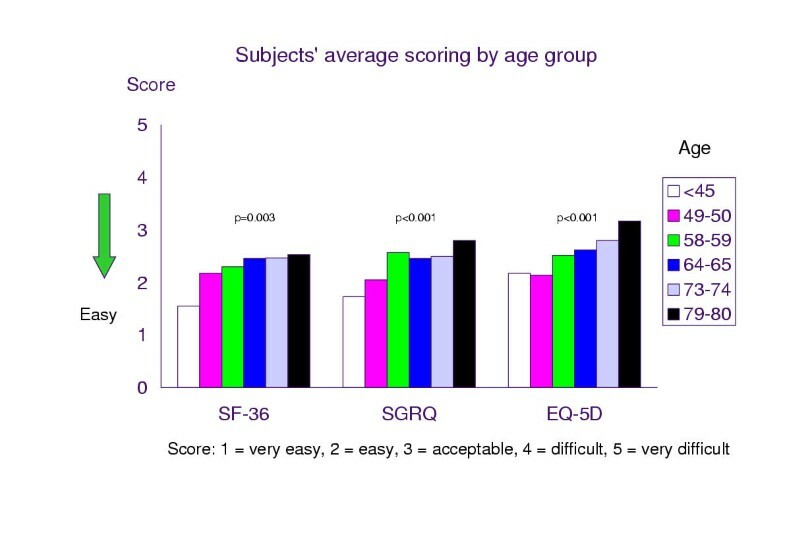 Data from the six age groups and SF-36, SGRQ and EQ-5D are shown in figure 1. The severity of COPD also influenced the difficulty experienced by subjects in completing questionnaires (Figure 2). Although higher scores were seen for increasing severity, the trend was not statistically significant after correction for other factors included in the model. Female subjects reported greater difficulty completing all five outcome instruments than male subjects did. However, the gender difference was statistically significant only for the EQ-5D (43% of the women scored 1 and 2 compared with 57% of the men, p = 0.026). The three socio-economic groups did not show any significant differences for any of the comparisons made in this study. The scores 1 or 2 of ease of completion of SF-36 were as follows: manual employees 50%, non-manual-employees 77%, and unemployed 58%. For the SGRQ the values were: manual employees 58%, non-manual employees 68%, and unemployed 42%. Similar values were recorded for the other three instruments. Nominal differences were seen but without statistical significance. The recorded mean time for completion of all five questionnaires was 39 ± 13 minutes (range 10–80 minutes). There was also a tendency that the disease severity affects the subject's need of time to complete the questionnaires. However, 95% of the subjects completed the questionnaires within one hour. In clinical research and in daily life, subjects are often required to complete questionnaires. The ability to understand and complete these forms correctly has not been studied to any great extent. Today COPD is a progressive condition, most prevalent in older men of low socio-economic status. Thus, the impact of age, disease severity, gender, and socio-economic status on the ability of subjects with COPD to complete a battery of questionnaires has relevance. The present study identified how subjects experience the difficulty of completing a number of well-used as well as new questionnaires. The number of questionnaires was high, however, in clinical research it may happen that more than two questionnaires are included. Compliance by subjects in this study was very high (only one subject failed to complete all questionnaires), probably due to careful and detailed counselling of subjects. Other studies have reported considerably poorer compliance, with illiteracy, visual impairment, poor physical and mental condition, and refusal cited as influencing factors . Subjects consistently found the HS-COPD questionnaire more difficult to complete than the other questionnaires. Reasons for this may be the complexity of the questionnaire or subject fatigue. HS-COPD was the last of five questionnaires completed by the subjects. In retrospect, the order of the questionnaires should maybe have been given in a randomized order to prevent a possible tiredness when completing the last questionnaire. However, in the present study we chose the same order to all subjects. One reason for doing so was that the common use of questionnaires in clinical research is in the same order. Otherwise the results of the assessments may differ. However, with the aim of this study, a randomized order would have been recommended. The HS-COPD utility measure is still under development and may need some refinement before it can be administered and completed with ease in future clinical studies (personal communication, Gordon Guyatt). The majority of the subjects taking part in this study was considered by the study nurse to have a good understanding of the questionnaires, and was able to complete them quickly and without difficulty. Despite this, certain issues did become apparent. Age appeared to correlate with the degree of difficulty experienced by subjects to complete these outcomes measures. The increasing incidence of concomitant diseases in the elderly with increasing age may influence their reading, writing, or cognitive abilities, and may explain the correlation. Disease severity probably also affects the ease of completing the outcomes instruments and this may be related to the subject's physical condition. Gender differences identified in this study could not easily be explained, however, a statistically significant difference was only noticed for one questionnaire, the EQ-5D. Unlike previous studies, no statistically significant differences between socio-economic groups were observed . In Sweden, the great majority of the population has quite good reading skills. Health-related quality of life, utility and productivity outcome instruments have an important role to play in the assessment of the general well-being of subjects with COPD. The ease with which these questionnaires can be understood and completed is pertinent to issues of compliance and therefore of accuracy in assessing the impact of this progressive, chronic disease. The importance of completing questionnaires in a reasonably short time should be highlighted. The burden of the subjects, as well as the burden of the clinic, can be high if a subject should need more than one hour to complete questionnaires. In the present study, the large majority of the subjects with COPD succeeded to complete the questionnaires during a relatively short time: 95% needed 26–52 minutes totally for all 5 questionnaires. In conclusion, the correlation of age with difficulty in completing questionnaires needs to be a consideration when using such measures in clinical studies of COPD. Disease severity may also affect the ease of completion. Further research in a large population is needed to have confidence of the collected data on subjects' ease of completion of outcomes instruments.